It is that time of year when people start reflecting on the year that was and begin planning for the one ahead. Some take it as an opportunity to reflect upon the lessons learned. See for example the posts from both Matt Esterman and Deborah Netolicky. Others use it as a time to simply stop and reflect. See for example Andrea Stringer’s post on strengths. As the new year approaches many turn their attention to various resolutions. Although I like to look back, this is usually either sporadic. See my post on lessons learned as a parent. Or somewhat academic, that is a reflection on life as a connected educator. See both Jon Andrews’ post, Steve Brophy’s look back, as well as my look back on a year curating a monthly newsletter. While looking forward, I prefer to cast a line into the future with an openness to what life may have to bring. I do this by focusing on one word and using this as a reference point throughout. 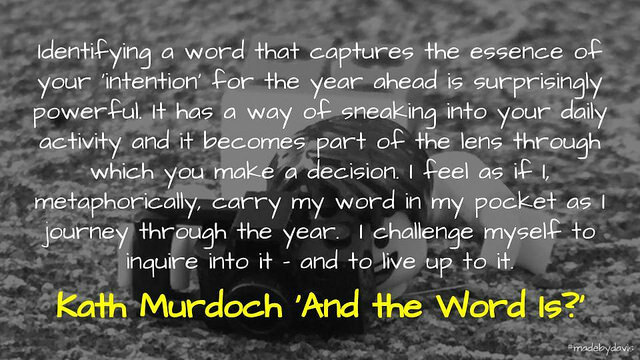 A few years ago, Kath Murdoch shared a post about focusing on one word. This changed the way I approached the yearly ritual of setting concrete resolutions that were lost by February. My one word last year was capacity. I set this with an eye to how I work with others and the ways in which I support them. I must admit that with the changes that have occurred this year (addition to the family, new roles at school, new job) I felt that I lost sight of this focus. Yet when I looked back recently, I realised that it has been there throughout. Although I have not done a lot of explicit coaching, where there is a set time with goals and intention, I feel that I have been involved in coaching as a ‘way of being’. To me this is what is meant by leadership with a little L. The area though that I feel is worth developing further is communication. Clarity – sometimes messages and meaning can get lost in their delivery, the challenge is when to add more or keep it short. Consistency – whether responding via email or working with someone in person, it is important to be consistent in regards to the way things are done. Collaboration – it can be easy to focus on the job at hand and the person that you maybe working with, however it is important to remember that it often takes a team and think about ways to keep everyone abreast. Context – so much of communication is about adjusting to the moment, it is important to change pitch or approach depending on the circumstance. Transparency – sometimes the key to communication is the culture that it is built upon, this though is often built upon other actions and activities. So that is me, what about you? Do you have any thoughts and suggestions? Are there any resources that you would recommend? Or maybe you have a word of your own? As always, comments welcome. My One Word for 2017 is Communication by Aaron Davis is licensed under a Creative Commons Attribution-ShareAlike 4.0 International License. Good communication is essential – to everything! It’s a great word to focus on for the year.